Internews believes that access to information is a root solution to many of the world’s problems. It enables women and men to participate in civic discourse, stand up for their rights, influence policy and social norms, and hold governments to account. When women's voices are heard, when women produce the news, the information we all consume improves. We believe that the empowerment of women and girls is a prerequisite for equal rights for all. But all over the world, women and girls’ voices are often ignored or invisible in the media, with far less content featuring their voices and views – just 10% of all news stories globally focus on women or girls, and roughly 80% of the “experts” interviewed by the news media are men. Women are also dramatically underrepresented in the industry itself. Globally, only 27% of the top management jobs in the media sector are occupied by women. Among reporters, it’s only 36%. And women and girls experience more intense online harassment, including sexual harassment. 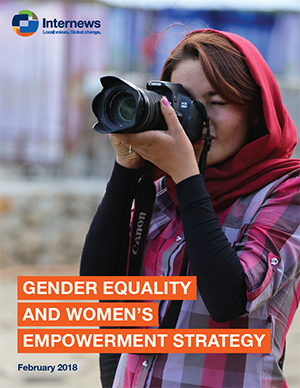 Internews launched an ambitious 5-year Gender Equality & Women’s Empowerment Strategy in 2018. This strategy shapes the way we plan, design, implement, monitor and learn from our work. It challenges discriminatory gender norms, and strives to advance equality across all gender identities. Involve men as active participants and help men challenge gender inequality, discriminatory gender norms and stereotypical gender roles.